Two data structures that you probably use frequently are hashtables and arrays. On the surface, they both allow you to perform common tasks such as adding data, accessing data, and removing data. To the untrained eye, they practically look like the same thing. What sets them apart is how they work behind the scenes, and this difference has a significant impact in how and when you would use them. By the end of this tutorial, you will have learned enough about how hashtables and arrays work to make an informed decision on which data structure to use. Let's get started! What we want to do is store these values and then retrieve the number of albums sold for any given artist. For example, if I wanted to know the sales figures for the Rolling Stones, I should be able to get 89.5 from my application very quickly. In the following sections, you'll see how to do that using both arrays and hashtables. I am creating a new array called myData. Initially, this array is empty, but I painstakingly add each artist and their sales figures. Notice that the artist information that I push into the myData array is wrapped in an array of its own as shown by the brackets. After all of this code has run, you have an array that contains many other arrays. Notice that I create a loop to go through each item in our array and check if the first value in the item's array (myData[i]) is the same as the artist we are looking for. Once the item and the artist match, we retrieve the sales figure and call it a day. If you had no idea where the value is and wanted to find it, you'll need to start at the beginning of your array and then move through each item and check if its contents match the value you are looking for. If your value is at the beginning of the array, you won't have too many items to go through resulting in you finding the value quickly. If your value is at the end of the array, you'll have to go through a lot of items and take more time finding the value. On average, we say that the amount of time it takes to find a value in an array is proportional to the number of items in your array. The more items, the longer it will take to find an item. Now that you have an idea of how arrays search for data, let's see how a hashtable would handle a similar scenario. To explain the code a bit, I first create a new Object called myData. Inside myData, I declare properties/keys named after our artists with the values set to the artists' sales figures. That's all you have to do. When you call myData["ABBA"], your browser evaluates that to 54.4. That's all there is to it. What you write is clean and simple, but what goes on behind the scenes is more complex. Hashtables work by finding the exact location your value is stored and returning that value instantaneously or nearly instantaneously. You may be wondering how that is done. In the above case, the key is "Pink Floyd", and the value is 110.1. 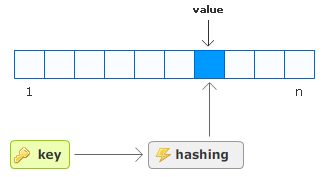 When your hashtable sees this key, it passes it through what sounds like a painful process called hashing, and the output of this hashing function is a number indicating where in the hashtable our value needs to go. If you want to retrieve the value from the hashtable, all you have to do is provide the same key. When your hashtable sees this key, the hashing function returns the same number of the location inside the hashtable containing your value. Once you have this number, the hashtable has no difficulty retrieving the exact value. Unlike with the array, notice that you did not have to scan through your hashtable to find the value. Because the hashing function returns the same index number for the same key, the hashtable knows exactly where to go to retrieve the value. From a performance point of view, the hashtable is generally a clear winner. It takes constant time to find the destination for a key and to place a value there. Retrieving a value is the same story. The hash function ensures that for the same key the same location of the bucket is returned. Arrays do not work with that same level of efficiency. If you know the index position of where your item is, accessing the item via the array is instantaneous. More than likely, you do not know where the item in the array the item you are looking for is. In these cases, you will have to scan through your items which linearly takes as much time as the number of items in your array. Not everything is about efficiency though. Sometimes, you will want to use an array if you will be iterating through the items. Iterating through your data sounds simple, but it isn't something you can easily do with a hashtable. I know, bummer!